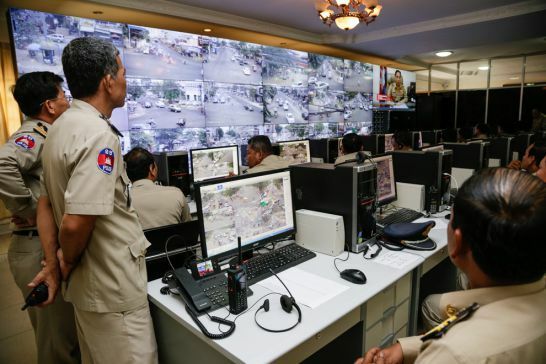 Police officers man computer terminals that are streaming CCTV footage of traffic on the streets of Phnom Penh yesterday morning at the Road Safety Monitoring Center. Some 200 surveillance cameras installed at Phnom Penh’s traffic lights were switched on for the first time yesterday, the National Police and Ministry of Interior announced. “These cameras will send data immediately to us, and we will be able to command our forces [to respond to] traffic crimes and other crimes that happen unexpectedly,” said Min Vanna, department director of the National Police’s radio centre. The cameras are part of a $3 million equipment package offered from China’s Public Security Ministry. Hu Bin Chen, deputy director of international cooperation at the Chinese ministry, yesterday said China plans to donate additional HD cameras, along with fire engines and water cannons in 2016. Police monitor video footage from CCTV cameras located around the capital yesterday morning. “I believe that the cooperation of both countries’ ministries of interior plays an important role in security for both countries’ populations,” he said.